Bob Berg, the former Area Sales Manager, with Universal Air Tools, who retired earlier this year, came out of retirement at the recent Auto Trade EXPO, to work on the Techplus stand. Bob, who was a regular visitor to Ireland, while working with Universal Air Tools, took up an invitation from Hugh Brady of Techplus to join the Techplus team at the Auto Trade EXPO. “We were delighted to have Bob on our stand at the Auto Trade EXPO,” said Hugh Brady. “Bob has been a regular visitor to Ireland down through the years and he will be missed by everyone at Techplus,” he added. 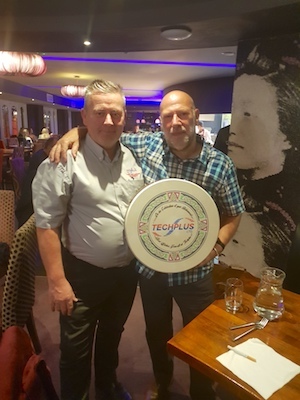 To mark music lover Bob’s retirement, Hugh presented him with a specially commissioned Techplus branded Bodhran.